Organic Amazonian Nutriblend™ Infused Oatmeal - A recipe from Savor California, the online showcase for extraordinary gourmet foods and beverages from California. 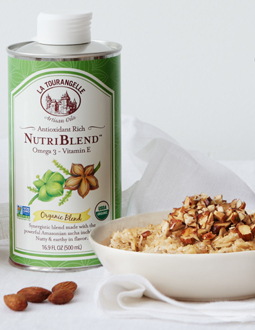 La Tourangelle's Amazonian Nutriblend™ provides a high daily intake of vitamin E and omega 3. The infused oatmeal combines all healthy ingredients, for a boost of energy that will keep you satisfied until lunch. Put the water, honey, 1 teaspoon of Nutriblend Oil, almond milk and salt in a small pan. Bring to a boil and add the oats. Reduce the heat and stir for 5 minutes. Mix the chopped almonds, Roasted Almond Oil and 2 tablespoons of Nutriblend Oil to create a paste. To serve, place oats in a bowl and put the nut paste in small dollops on top. Garnish with fresh fruit.